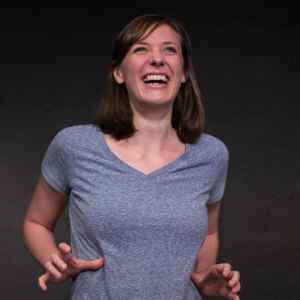 Katie Rush has been a happy member of DC’s improv community since taking her first WIT class in 2011. A graduate of WIT’s training program, Katie has also studied at iO Chicago, Studio Theatre, and Theatre Lab. She is a member of WIT ensemble King Bee and the indie troupe Sweater Kittens. Previously, she performed in WIT’s show Improv Actually and with indie troupes Neighbors, Prettier than You, and Escaped from Alcatraz. The most notable inscription in her 7th grade yearbook was “Stay tall.” She has. Katie’s favorite thing to do as a kid was to play pretend. Not too much has changed since then. Now as a teacher at Washington Improv Theater, she enjoys helping others connect with their creative sides to develop memorable characters and stories of their own. In scene work, she prioritizes strong relationships and honest emotional reactions. She aims to make the classroom a supportive place for taking risks, to help students get out of their heads and up on stage. SELECTED AS ONE OF THE REGION'S BEST COMMUNITY-BASED NONPROFITS BY THE GREATER WASHINGTON CATALOGUE FOR PHILANTHROPY. Site Design: The General Design Co.